Known for its unique texture and taste, Rajpora ‘Sheermal’ became a popular Tandoori delicacy soon after it came out of the kitchen of a local elite family. Mostly preferred for daily consumption, functions and festivals in Kashmir, the Sheermal is now in demand across India. Beyond its bustling bazaars some 30 kms from Srinagar, Rajpora town in Pulwama district conveniently defies the usual country look. Known for its bearcats and high-literacy rate, the town houses specialised bakers, who were exclusively catering to the local elite family with their specialty called Sheermal in the days of yore. But now, their exclusive delicacy has become a delight of the masses. Scores of smoke-filled, rundown baker shops in Rajpora square wear a lazy morning look — sleepy, sullen and silent. Among the early risers are some elders waiting for oven-fresh bread. With sun shining past 9am, bakery kiosks are being adorned with Sheermals in steel long treys, twig and nylon jars in a sequential manner. 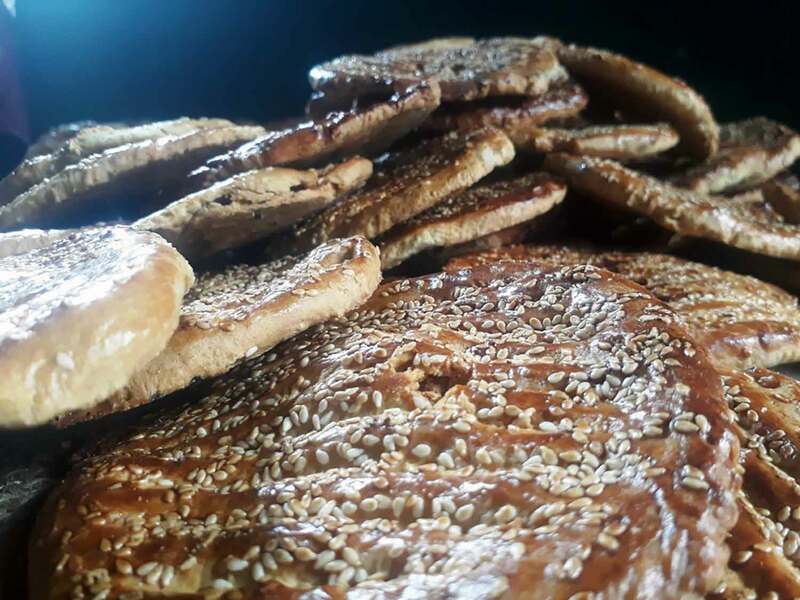 Rajpora Sheermal is the sesame daubed circular-crispy bread, having a brown groovy surface. The bakers use a big bowl in which they add flour, sugar, baking soda, ghee and milk, before mixing it nicely to make little soft dough. They divide the dough into small equal pieces, and roll them into small circular shaped chapattis. Before placing splayed Naan into the Tandoor (firewood fuelled mud-furnace), the bakers apply a coat of sesame seeds and egg white on its top. At a stone’s throw, in another smoke-filled shop, baker Ghulam Hassan watchfully stands behind the stacked Sheermal trays and near a blazing Tandoor. Kneading refined flour in an iron tub, Hassan’s beaming face makes him come across as a friendly person. Bakers mostly prefer almond and kicker firewood—known for its high energy value, and less smoke emitting feature—to bake Sheermals. Qadir Sofi was the first baker in Rajpora who made Sheermals some six decades back, Hassan says. “He died when I was still young,” Hassan says. Before Sofi, however, many other bakers had baked the popular bread in the valley, where the foreign rulers—Mughals and Afghans—had introduced many delicacies. In India, however, historians trace the origin of the popular bagel with the arrival of the Turko-Afghan rulers during the medieval period. Later in the Mughal period, the Tandoor culture picked up steam, with Naan bhais—bread bakers—began baking Khameeri Roti, Kulchas, Girdas, and other baked items. In Kashmir and especially in Rajpora, Sheermal gradually cemented its place and emerged as a favourite delicacy. But before commoners would crowd the baker shops in Rajpora, Sheermal was exclusively an upper class food, mostly found in Drabu kitchens, Ghulam Mohammad Sofi, an elder baker says. But now, when the sun has long set over feudalism, the bagel known for its friskiness and fetching structure has become the commoner’s bread.